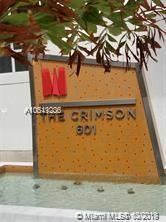 The Crimson offers luxury living and convenience at an affordable price, comparatively speaking. This delightful condominium, set on the western side of Biscayne Bay, will feature a collection of residences that range from one bedroom to three bedrooms. All homes at The Crimson will have inviting terraces, high ceilings, and generous closets. If you’re interested in residing at this property filled with frills and comfort, look no further than the condos for sale below.